Today, I began to explore my new neighbourhood. The new place I’m living at doesn’t have internet just yet, and so I’ve been café hopping more than usual. This morning I stumbled upon Muffin Break. I was greeted by the friendly woman at the counter. “Hello! How are you doing today?”, she asked. Her name is Rose and she is my stranger of the day. She was so patient as I indecisively pondered what I would order. There were so many choices, all homemade. 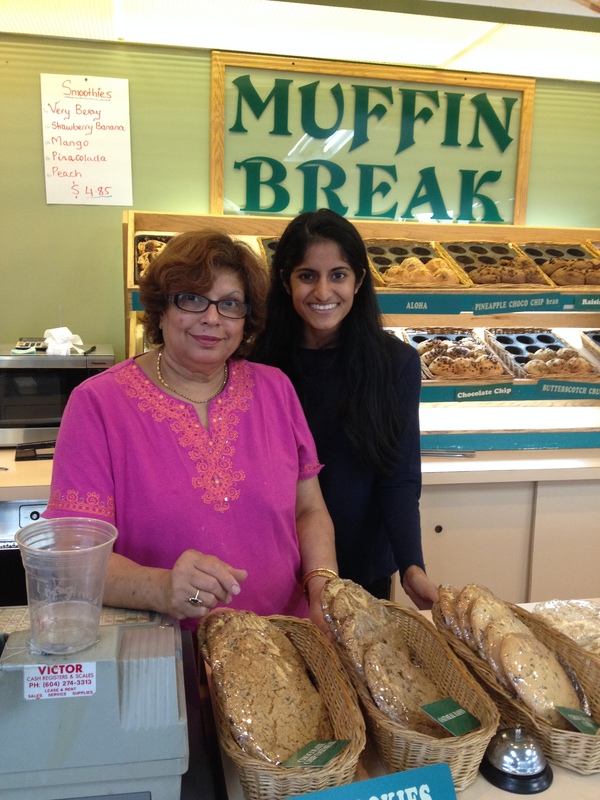 Muffin Break used to have 47 locations across Metro Vancouver. It was kind of reminiscent of a Tim Horton’s chain. Now there’s just this one left standing, down on 4th and Alma. As I sat and worked, I noticed something truly remarkable. As people walked through the doors into the café, Rose would ask things like “how’s your mom doing?” and “how was your vacation?”. They would ask her the same questions back. Rose knows her customers on a personal level. I don’t think I’ve ever witnessed anything like it, other than in old movies. It’s something really special that she’s grown and nurtured over the last three decades she’s been working there. “I’ve watched some of these people grow old”, she told me. She loves working there and chatting with her customers. While I was eating my lunch, she spoke with me, asking me with genuine curiosity about what it is that I do. These days, our interactions with the people who prepare our food and beverages seem to be increasingly impersonal. It’s possible to order a drink and pay for it without even making eye contact with the sales clerk. Rose’s Muffin Break seems to have cultivated a community. And I noticed that I was the only one there doing work while eating my food. The other folks who were there were actually there on their muffin breaks. I feel like that’s the way it should be. Hi Nargis – wow, small world! I will definitely mention it to Rose.